In previous articles (see here and here) we wrote a number of times about the notion of organizations operating in NOW Mode, an idea that seems appealing to many. But while people working in NOW Mode – uninterrupted flows of activity, virtually no accumulation and tremendous speed – is exciting, it is not clear for most how to actually do it. Thus, we developed a model for arranging people in the workplace so as to enable them to achieve this way of operating. This model is called HIVE – which stands for Human Interaction Virtual Environment and was introduced in the previous article in this Blog. In this current write-up, we want to provide a bit more detail about the HIVE construct and a better idea of what’s involved in actually operating core business in this manner. What’s in a HIVE Unit? First, let’s review what this HIVE ‘thing’ is all about. In the HIVE concept, groups of individuals of diverse skills interact in response to external events through a behavior that is natural in human beings called Spontaneous Association, whereby these individuals, when faced with a common problem or goal will spontaneously combine their skills to construct solutions for that problem. Action pathways amongst these individuals are manifested through conversations that, of course, are based on the capabilities of each individual. Some pathways follow standard practices; some are one-off solutions to one-time events; and others are self-learned pathways that the group improvises collectively and repeat over time in the face of problems already seen in the past. Any such group of individuals is called a HIVE Unit or simply a HIVE. There are documented cases (see here and here) of HIVE-like groups handling major crisis without any established plan, structure or direction and without a predefined set of required skills. However, our thinking is that in a business Enterprise with a specific value proposition to the market and in industries with regulated constraints (e.g., Financial Services, Pharmaceuticals, Food, Hospitals), the way things are done can’t be left to the open improvisation of individuals. So… How do you leverage this amazing weapon called Spontaneous Association in a business with a specific value proposition, established goals and with regulatory (or otherwise) constraints on operational practices? The constructs that make up the HIVE model are aimed at responding to this question in a fairly predictable fashion. A HIVE Unit has to have a very clear mission and collective responsibility. That mission can’t be Functional in nature. For instance, “Chemists”; “Finance”; “Marketing”; or “Engineering” are not HIVE Units. 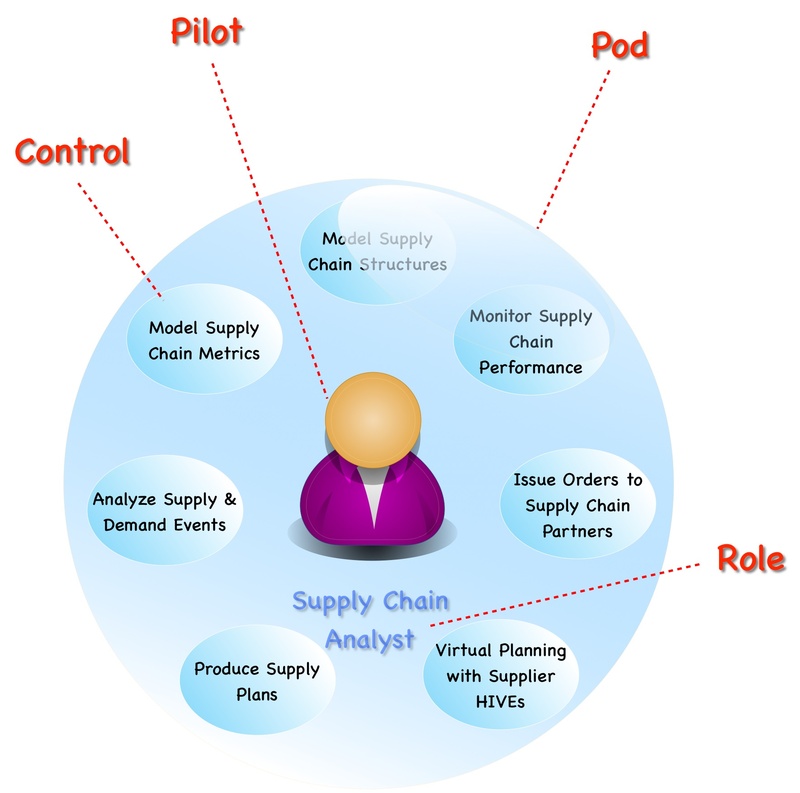 The mission of a HIVE Unit has to be a deliverable that is significant to a customer. This is a simple definition: “significant to a customer” means that the customer would recognize it as being important, as something he could actually do something with, and something he is willing to pay for. Remember, customers pay for everything the business does (unless you’re not making a profit). For example, if a software company is building a major application, it could have a HIVE Unit for the entire application (delivered bug-free); or, it could have a HIVE Unit for a substantial Sub-System or Module that a customer could implement (also delivered bug-free). In a Research & Development environment, it is conceivable to have intermediate deliverables that are meaningful to customers such as: Formulation; Prototype; Final Product; and a HIVE Unit for each. Inside a HIVE Unit there are individuals that play various Roles. Each Role is encompassed in a Pod and each Pod contains a number of capabilities that are characteristic of that Role, which are called Controls. The person assuming the Role can be seen as the Pilot of the Pod. Controls are parts of processes or whole processes. They represent the knowledge, tools, tasks and documents as needed for the Pilot to execute the tasks encompassed by the Control. So… Whether a HIVE Unit acts predictably and produces a predictable outcome depends on how Roles are set-up, how Controls are defined, how individuals are trained to become Pilots (i.e., assume the Role) and how, finally, you choose the subdivision of Units and the missions you assign them. Note: the same Role can appear in more than one HIVE. It may appear eccentric to use video game terminology to express the key construct of the HIVE model, i.e., what we called the Pod. However, this is a metaphor and the symbology chosen for this metaphor is intended to make it easier for people to understand the mechanism of Spontaneous Association as well as to distance people’s understanding from classical forms like Functional Org Structures and Business Process Maps. And here we are – at the point where you either succeed in using the HIVE Social Model or whether you completely corrupt it by trying to control it. So, let’s make this very clear: a HIVE is just a group of individuals who are working together to accomplish a mission. There are no lines in a diagram saying “they will interact like this” – that would be counterproductive. There are no detailed procedures saying: in this case, the action pathway is this; in this other case you follow this other path. What you have to make sure is that any individual that is taking on a Role is well trained on the necessary skills to carry on the Controls of that Role. But what you never do is train the chosen members of a HIVE on exactly how to interact and what pathways to use in response to any event. As mentioned previously, action pathways are instantiated by the individuals in the HIVE in a Spontaneous manner. Hence, HIVE’s are self-learning and self-adjusting as individuals learn about each other, experiment and discuss various solutions and, in time, gain experience in problems that keep re-appearing and thereby reuse previous pathways. A group of individuals working together can construct these problem-solving pathways faster than any one manager could conceive in a closed office on his or her own. To try to prescribe pathways is counterproductive and frankly unwise. In time, HIVE’s will evolve on their own, there will be skill sets that migrate from HIVE to HIVE or are repeated in multiple HIVE’s. Equally, new HIVE’s are likely to appear from within, rather than formed by management. It is really essential that you follow a few rules in establishing Roles and Controls for the various Pod’s of your business. The rules are few and simple but they are really important. Clear: there can be no confusion as to what the Role entails. Unique: whatever it does, it has to be the only one that does it. If you combine Unique with Clear, you get Unambiguous – the most important aspect of Roles in a HIVE. Simple: when you look at the definition of a Role, you get the impression that it just does one thing. It doesn’t mean it performs only one task but it has only one basic responsibility. If a Role is Simple, it is easier to make it Clear and to verify if it is Unique and therefore Unambiguous. Then ask them to define each Role with just one short sentence. You will surely observe a great deal of debate in some cases, debates that as much about the responsibility of a Role (i.e., it is not clear) as about what that responsibility ought to be. Many times people will immediately find redundancies between Roles and they will find that some Roles are complex (rather than simple) as well. So, if you want to use social networking at the core of your business and take advantage of speed and waste reduction, you have to spend some time purifying Roles and their definitions. Now for Controls: basically, Controls follow the same rules as Roles. They too – each of them – must be Clear, Unique and Simple. If they aren’t, then the Roles they’re associated with aren’t either. Think about it: you choose a few customer-significant missions (there can’t be many); you grab all the Roles necessary to achieve each mission and you group them into HIVE’s – one per mission; each Role is in a Pod; you assign an adequate number of individuals to Pilot each Pod; you connect them into a Virtual Space using Social Tools; and you let them go! What can be easier or simpler? You – and I mean the manager, the executive – don’t have to assign work or plan work or figure out how to react to surprises, to things that don’t work. You just have to observe – and if you are using Social Tools, observing is easy because everything is public and updated in real time! In the HIVE Model, Leaders aren’t supposed to command; they are supposed to Direct and Align! Leaders can step into a conversation thread but they won’t be part of the interaction, their comments will work as corrections of course and so they step in, they nudge and they step out. People in a HIVE don’t interact with a Leader; they interact amongst themselves. When they ‘see’ the Leader, they observe him/her and take their guidance and then they move on. It is simple, it is beautiful, it is powerful and it is amazingly competitive.